If you’re like me then you revel in the fact that Oreo flavors are pretty much endless. I have a few favorites (like Rocky Road Trip or Oreo Thin Bites Fudge Dipped), but I also get excited whenever a new flavor comes out (Carrot Cake anyone?). One of my classic favorites though has to be the Birthday Cake Oreos. The two chocolate cookies sandwich birthday cake flavored creme filling and sprinkles! 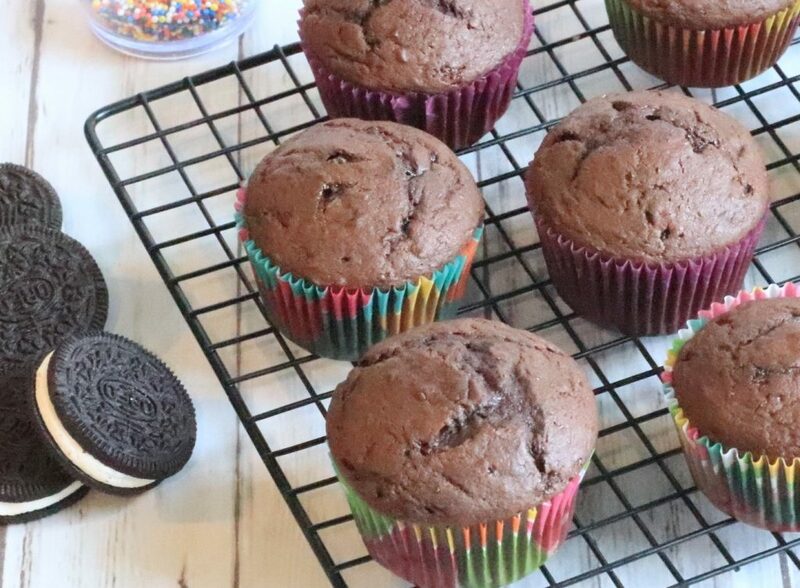 And they are perfect for these Oreo Birthday Cake Cupcakes! Start by making your cupcake batter. Preheat your oven to 375 degrees. In a large bowl combine flour, unsweetened cocoa powder, corn starch, baking powder, salt, and baking soda. Mix well. Next add your eggs, vanilla extract, greek yogurt, dark brown sugar, vegetable oil, and granulated sugar. Again mix well, until there are no more lumps. Fold in your crushed Oreos (we pulverized about 7 cookies ahead of time in the food processor). 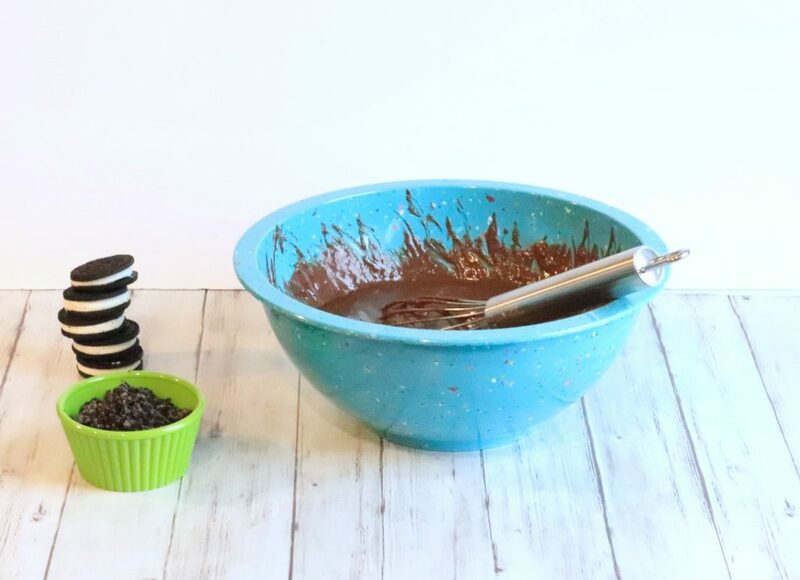 Line your cupcake pan with liners. Carefully spoon in the cupcake filling. Leaving about an inch or so of room to the top. Bake for about 8 minutes. Turn the pan completely around, bake for an additional 5-7 minutes. You can tell if the cupcakes are cooked throughout by inserting a toothpick in the middle and checking to see if it comes out clean. Once cooked allow them to cool completely on a cookie rack. If they don’t cool completely you’ll have to worry about the frosting melting off of them. To make the frosting beat the Vanilla Extract & Softened Butter in a mixer. Carefully add the heavy cream. Then, gradually add the powdered sugar until your desired consistency is reached. Pipe the frosting on to the top of the cooled cupcakes. Next, Take your Oreo half and dip the round side into your sprinkles. They will naturally stick to the cream. 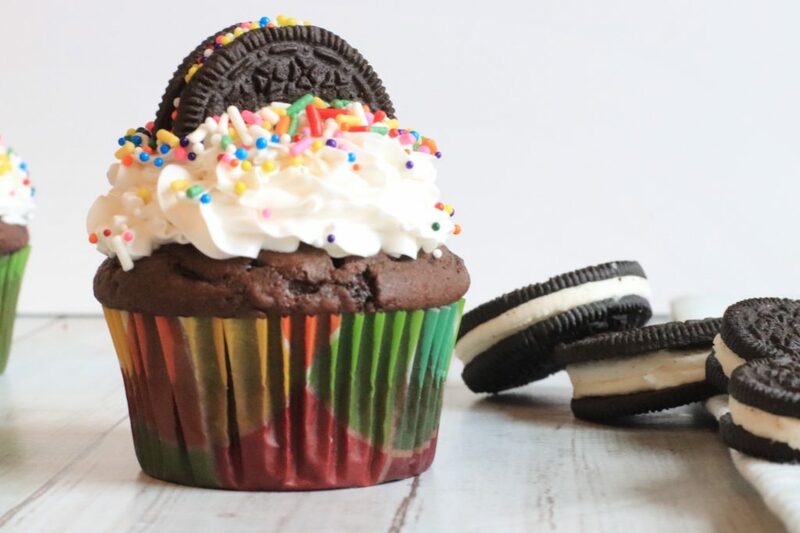 Now place each Oreo half right in to the top of your frosted cupcake (flatside down). Finally, add some rainbow sprinkles all over the top of the cupcake! 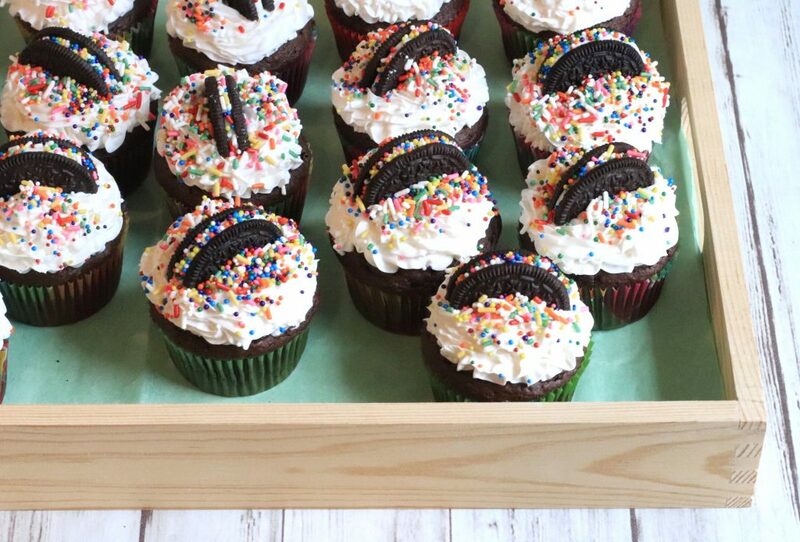 These are the perfect treat for a Birthday Party celebration! 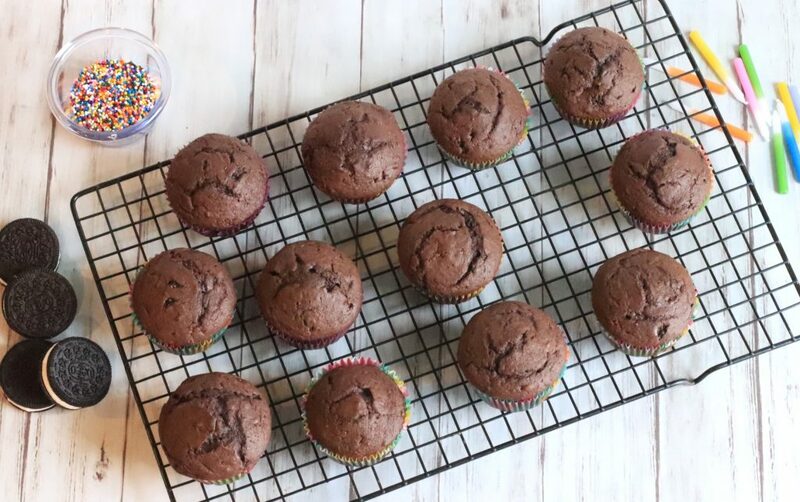 Line your cupcake pan with liners. Carefully spoon in the cupcake filling. Leaving about an inch or so of room to the top. Bake for about 8 minutes. Turn the pan completely around, bake for an additional 5-7 minutes. You can tell if the cupcakes are cooked throughout by inserting a toothpick in the middle and checking to see if it comes out clean. Once cooked allow them to cool completely on a cookie rack. To make the frosting beat the Vanilla Extract & Softened Butter in a mixer. Carefully add the heavy cream. Then, gradually add the powdered sugar until your desired consistency is reached. Pipe the frosting on to the top of the cooled cupcakes. Next, Take your Oreo half and dip the round side into your sprinkles. 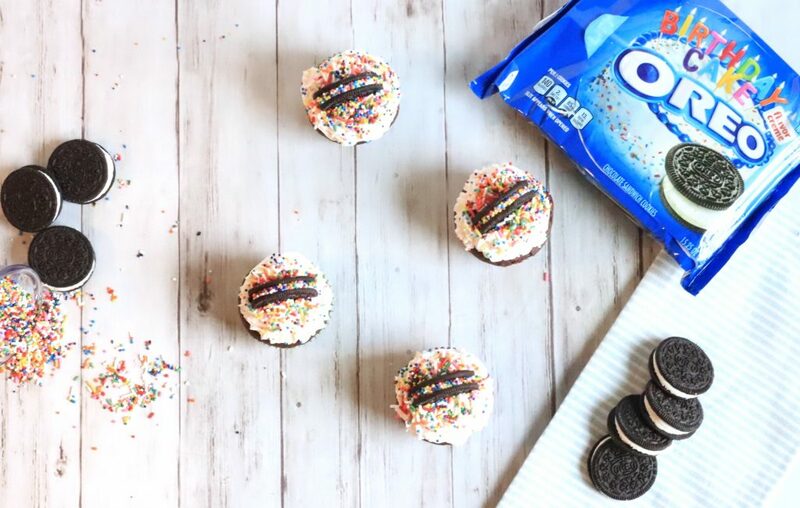 Place each Oreo half right in to the top of your frosted cupcake (flatside down). Finally, add some rainbow sprinkles all over the top of the cupcake! I know our grandchildren will love this. Next get-together I will make them for the boys. 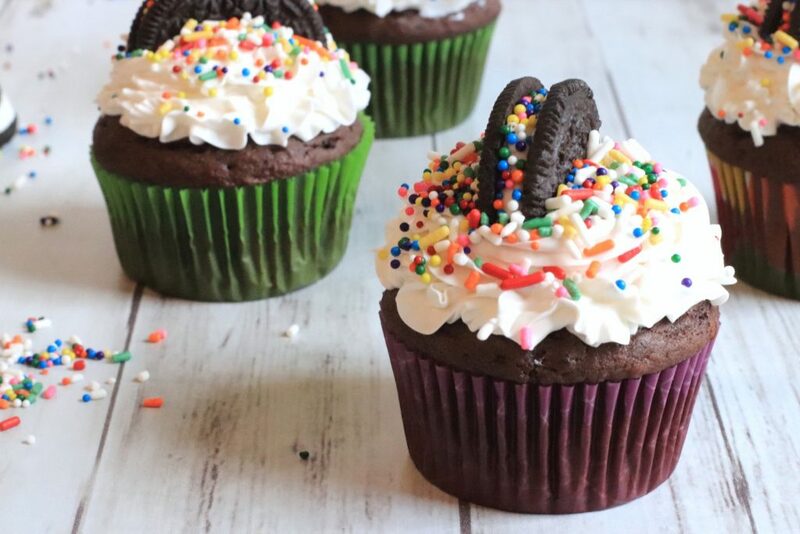 These cupcakes look like so much fun to make and EAT! 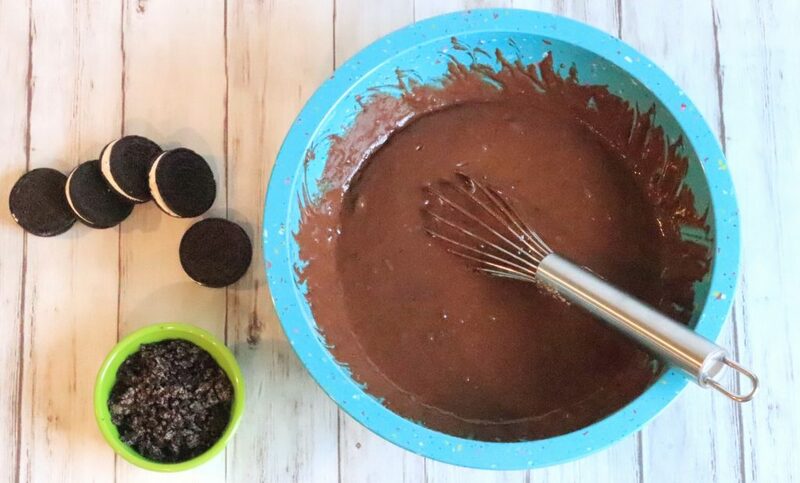 I love that the recipe is so versatile that you can use any flavor of Oreo cookie! These look amazing! I have an unhealthy obsession with Oreos. 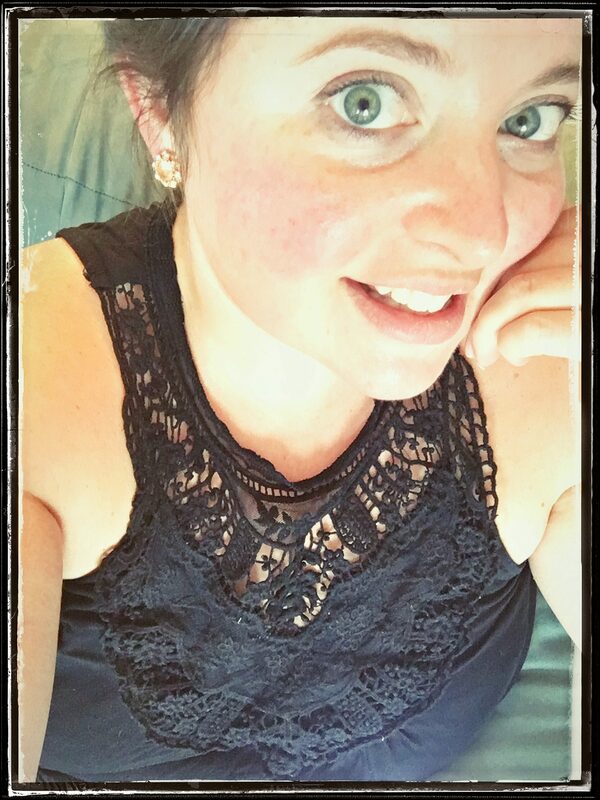 These would be perfect for a birthday party for sure!